1. In large skillet, heat oil over medium-high heat. In 2 batches, add beef and cook 5 minutes or until beef is browned, stirring occasionally; transfer to 5- to 6-quart slow cooker. 2.Add tomatoes with their juice, broth, carrots, celery, garlic, potatoes, bay leaf, onion, wine, parsley, Worcestershire and thyme. 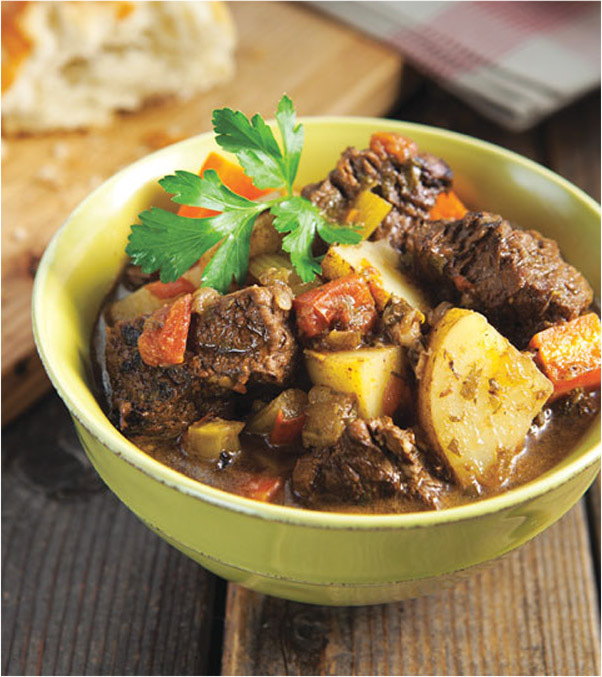 Cover and cook on low 9 to 10 hours or until beef and potatoes are tender. 3.In medium bowl, whisk water and cornstarch; stir into slow cooker. Increase heat to high; cover and cook 15 minutes or until thickened. Remove and discard bay leaf; stir in salt and pepper. Serve garnished with parsley sprigs, if desired.